Frederick was born in Thatcham in 1893, the second son and third child of Henry Edwin Breach and his wife, Ada Caroline (née Denness). He was baptised on 1 October 1893 at St Mary’s church, Thatcham. At the baptism his father gave his occupation as ‘engineer’, quite what this entailed is not clear although he does qualify it in the 1891 census to ‘Engineer Beaterman at Paper mills’. Presumably he was looking after machinery at the mills, which would most likely have been those at Colthrop to the east of Thatcham. During the early years of their marriage Henry Edwin sen and Ada lived in Thatcham Newtown (to the west of central Thatcham) but moved to West End, Brimpton ca 1904. Theirs was a productive marriage, they had at least 12 children – mainly girls: Mary Ann (1890), Florence Amy (1895), Winifred Ada (1897), Ellen Matilda (1899), Daisy Blanch (1901), Mabel (1903), Elsie May (1906), Ethel Elizabeth (1907) and twins, Alice and Rose (1910), but there were two sons, Henry Edwin (1892) and Frederick George (1893). In 1911 his family moved from Brimpton and into Newbury, where they lived for a while at 13 Jack Street before moving on to 52 St George’s Avenue (a post-war development of ‘homes fit for heroes’). Frederick followed his father to work in the paper mills, moving out of the crowded family home to lodge with his mother’s sister Amy Hazell and her family in Thatcham Newtown. 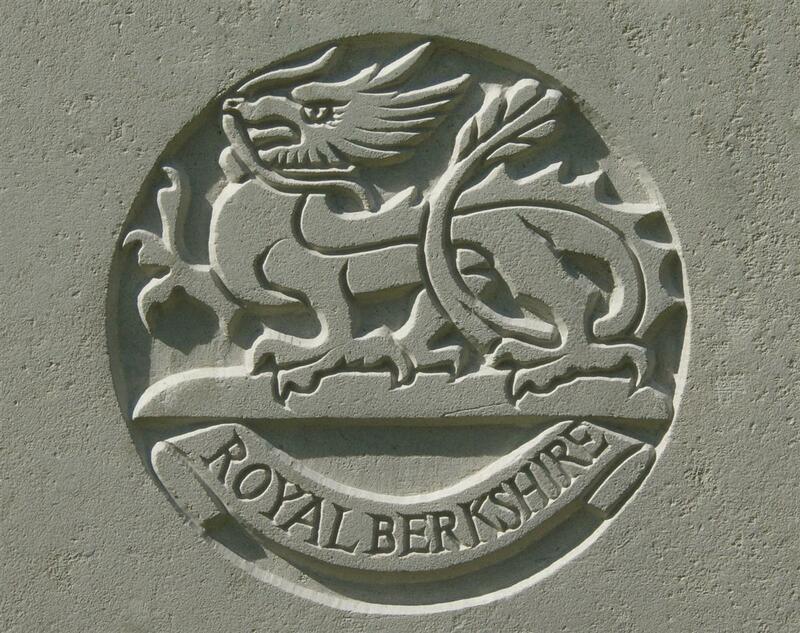 However, in 1911, he followed his brother Henry’s example and enlisted with the Royal Berkshire Regiment on 8 August. The following year, having completed his basic training, Frederick was posted to the 2nd Battalion of the Royal Berks, which was stationed in India. When war was declared in August 1914 the 2nd Battalion was immediately recalled to England, landing at Liverpool on 3 October. The battalion joined the newly formed 25th Brigade in the 8th Division, which was made up of units recalled from all corners of the Empire. A month later the Division crossed to France, Frederick landed on 6 November. A week later, on 14 November the Division took over a section of trenches at Fauquissart, their first experience of the front line. Although there was no great offensive underway there were casualties, including Frederick, who was wounded on 22 December. The battalion’s war diary entry for that date is short: In billets at Levantie. 5 men to hospital. Although the men were in billets (relatively safe quarters behind the lines) the were plenty of opportunities for casualties. Working parties would often be sent forward to work in the support trenches, well within range of German artillery. Even training could be very hazardous – especially bomb (grenade) training. After a few months in hospital and convalescence he returned to France, this time to the 1st Battalion Royal Berks rather than the 2nd. It is not known exactly when he returned to action, but it is possible that he was sent as a draft of reinforcements following the 1st Battalion’s heavy losses during the Battle of Loos – which would explain his change of battalion. On 1 July 1916 the Allies launched the first of a series of offensives known to history as the Battle of the Somme. Frederick’s old battalion went over the top on the first day and suffered horrendous casualties, but the 1st Battalion was not called into action until 27 July when they were sent in to recapture a section of Delville Wood that had been fought over since 15 July. The battalion achieved its objective but took heavy losses – 8 officers and 256 other ranks killed, wounded or missing. Frederick was one of the 37 other ranks listed as missing. His body was found a couple of months later near a support trench – which might, of course, have been the front line on 27 July. Mr and Mrs H Breach of 13, Victoria-street, Victoria Park have received the sad news of the loss of their second son, Pte Fred Breach, of the Royal Berks Regiment, who was killed on July 27th , 1916. The information was contained in a letter dated September 1st, sent by the Rev W Telfer, Church of England Chaplain, by the Rev JW Harford, Congregational Minister, in which the writer says:- “I write to you to tell you of the burial of 9573 Pte F Breach, 1st Royal Berks Regt, whom I gathered to be a member of your congregation. I found his body lying in the vicinity of our support trench. Owing to exposure to the weather it was impossible to recover any of his personal effects, but there were four testaments and portions in his tunic pocket, one containing the Diocesan Form signed, and another was the one given to him by the church.” The Chaplain concluded his letter with a request to the Rev Harford to hand out the information, as he could find no address. Pte Breach was in India when the war broke out, and was sent to the Front, being wounded on December 22nd of that year. After several months in hospital, he rejoined his regiment, and had been on leave, returning on June 9th last. This is the second bereavement sustained by Mr and Mrs Breach, their eldest son, Pte H Breach, of the 1st Royal Berks, having been killed in action on March 1st , 1916. Pte F Breach, son of Mr and Mrs Breach, of Newbury, whose death in action was recorded in this paper the other week, was better known in this village than at Newbury. He was a Thatcham lad, and made this his home. It is his local friends who greatly mourn his death. He spent a lengthy time here recuperating from his former wounds. We will remember his cheerfulness and joviality. He brimmed over with gay spirits and humour. As can be seen from the newspapers Frederick was buried in 1916, but he now has no known burial place. Presumably his burial plot was destroyed in subsequent fighting and bombardment. He is now remembered on Pier and Face 11D of the massive Thiepval Memorial to the Missing of the Somme. Frederick's name on Newbury War Memorial - imediately below that of his brother Henry. Locally Frederick is remembered on tablet 10 of the Newbury Town War Memorial, the memorial board and roll of honour in St Nicolas Church, Newbury, the Thatcham War Memorial and the memorial board in St Mary’s Church, Thatcham. 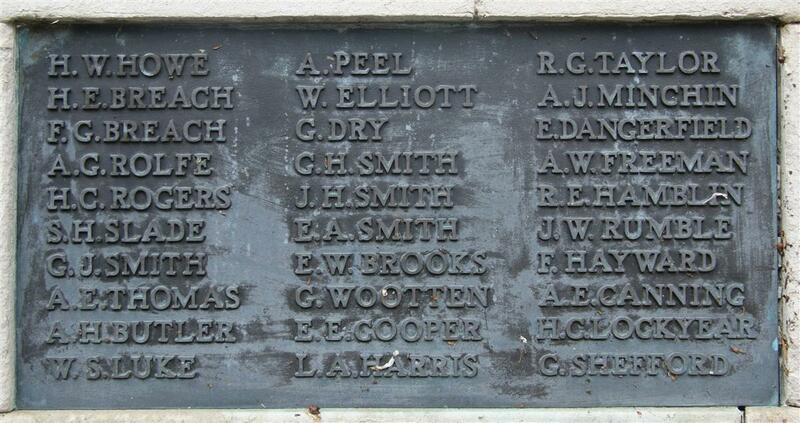 For some unknown reason he is recorded on the Thatcham memorials as T G Breach. Perhaps he was known by a nickname of Tom or somesuch, but it could easily be that a handwritten F was mistaken for a T.
His elder brother, Henry also served in the 1st Battalion Royal Berks and died a few months earlier. For some reason Henry's name was omitted from the memorial board in Thatcham church, but appears on all the other memorials commemorating Frederick. Their mother Ada must have been shattered by the loss of both of her sons but more bad news was to follow; her cousin Harry Denness (son of her uncle, Edmund Denness) died in December 1917, also serving with the 1st Battalion, Royal Berks; and her nephew Godfrey Denness (son of her brother Thomas) died in August 1917 while serving with the 15th Battalion, Hampshire Regiment. Both are remembered on the same Thatcham memorials as Frederick.